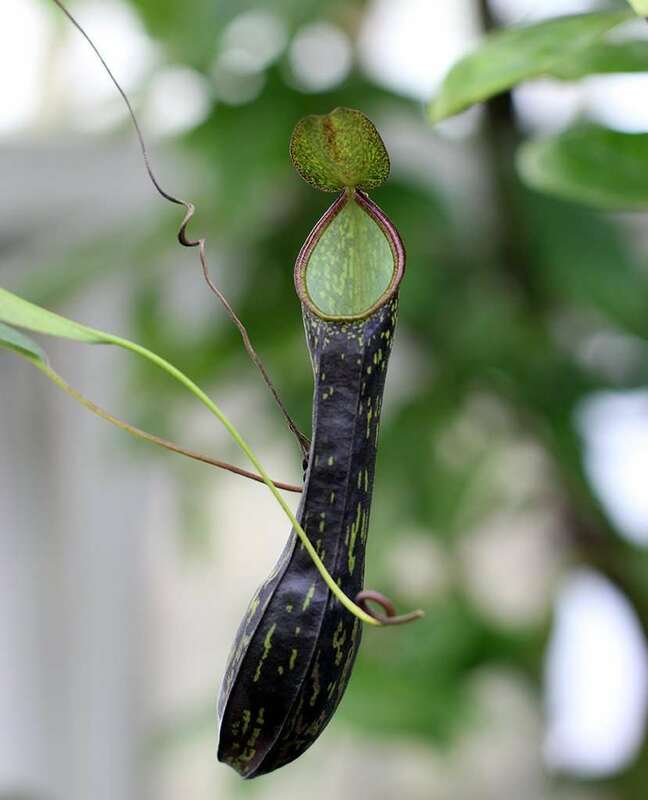 Nepenthes x ventrata is a naturally occurring hybrid of N. ventricosa and N. alata. 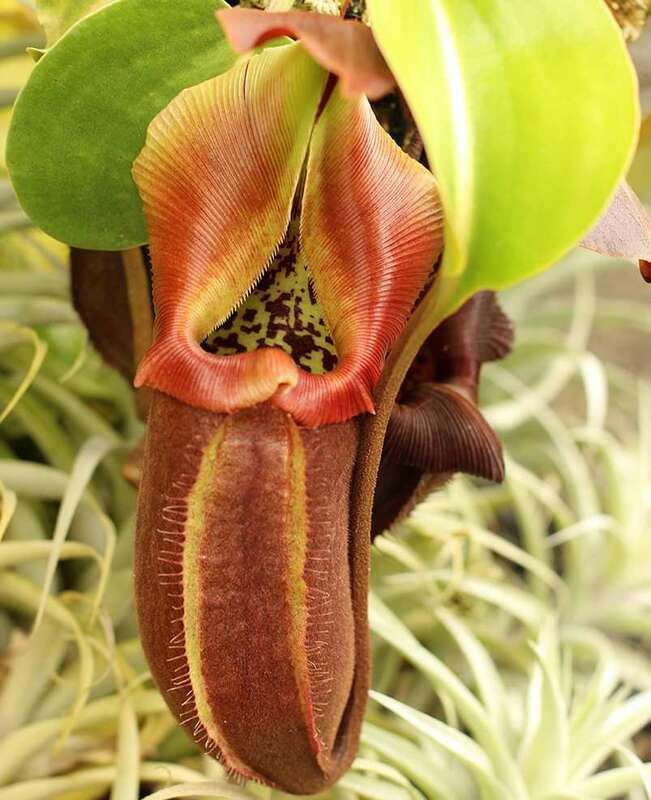 The name is a sly combination of “ventricosa” and “alata,” like “Brangelina” (RIP), but with Nepenthes. 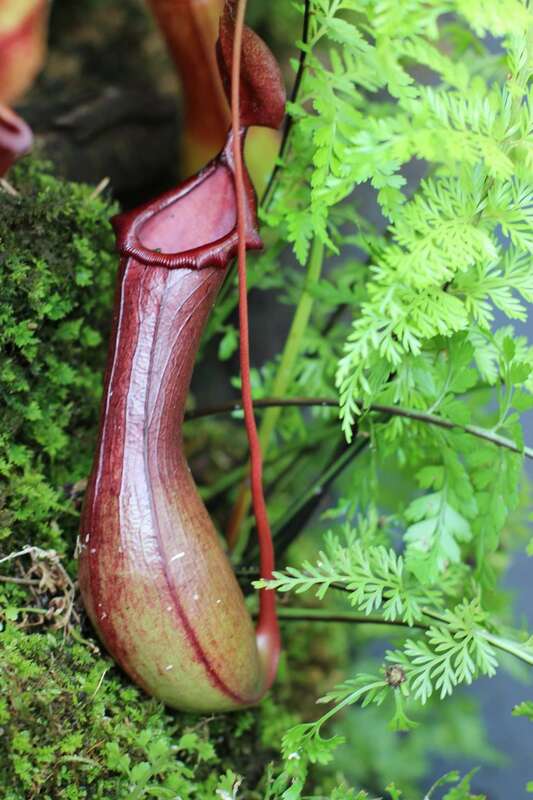 Our celebrity plant name was introduced to the world in a 1979 edition of the Carnivorous Plant Newsletter. 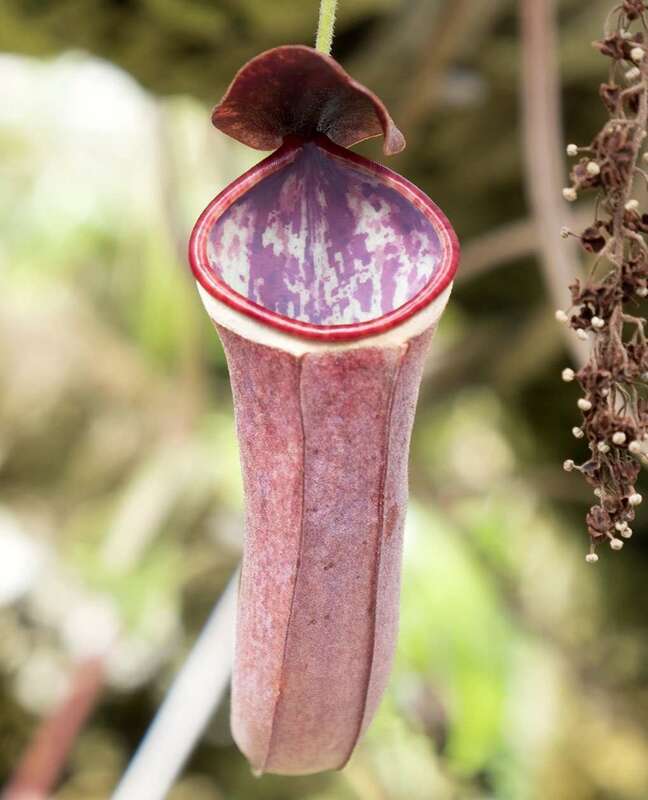 Both parents hail from the Philippines, so naturally, this hybrid tropical pitcher plant can also be found in the Philippines. 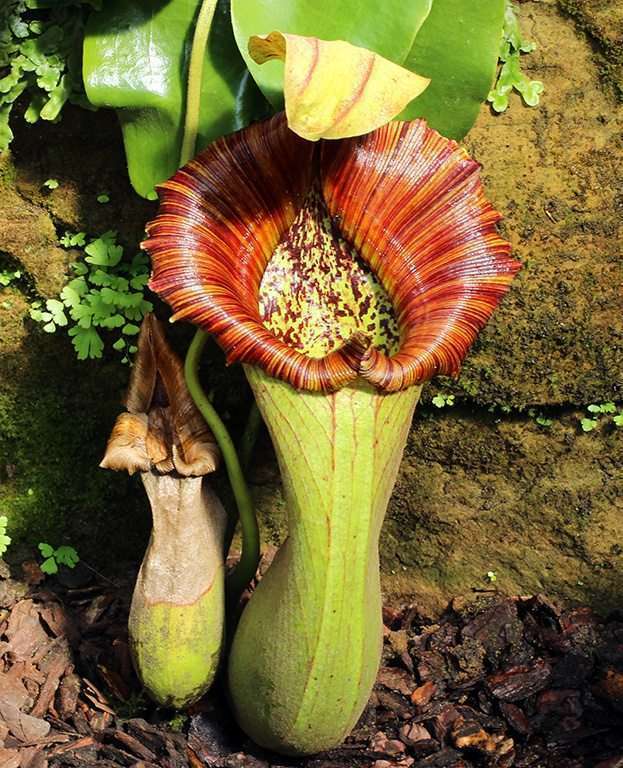 However, I’m willing to wager that there are significantly more of these plants outside the Philippines than in. 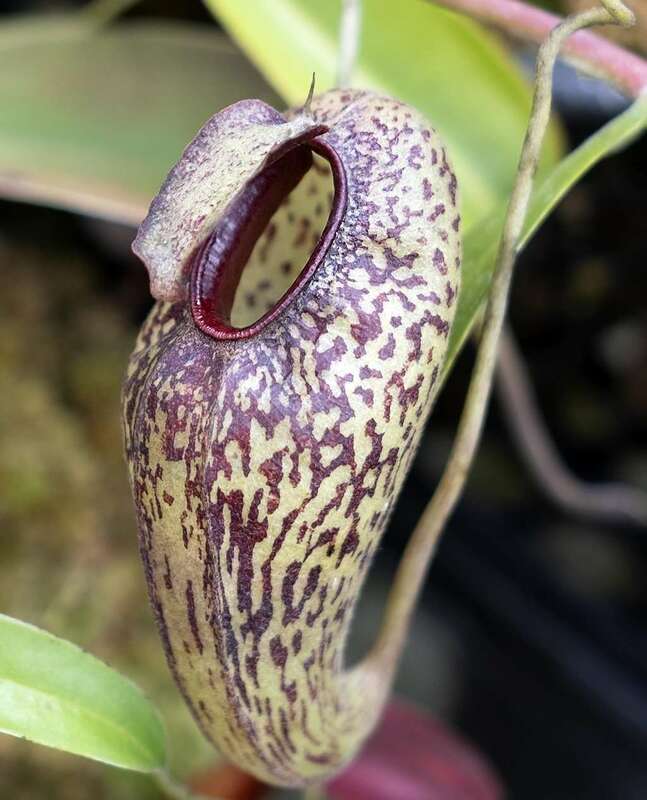 It’s one of the most common Nepenthes species in collections due to being widely cloned and distributed via tissue culture. 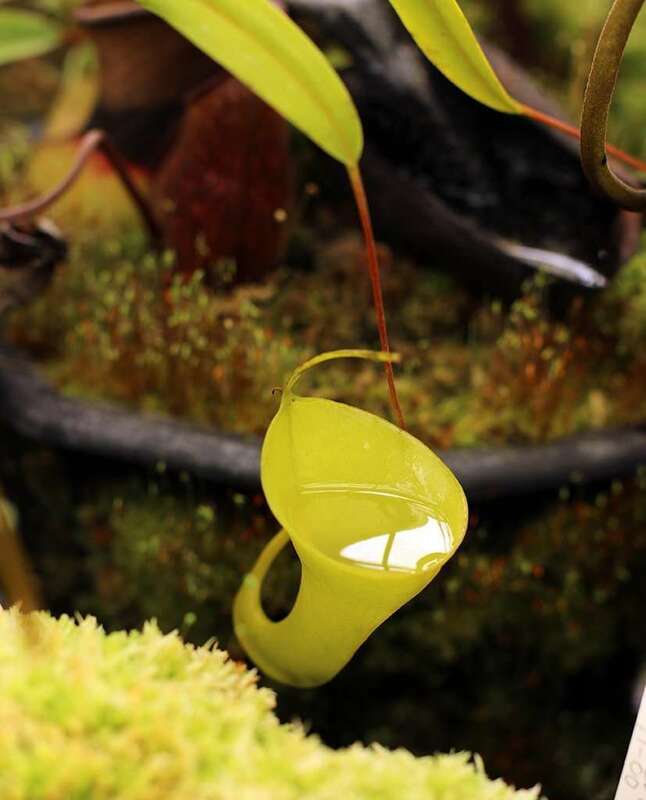 In fact, many nurseries and garden shops will stock these like they do orchids. 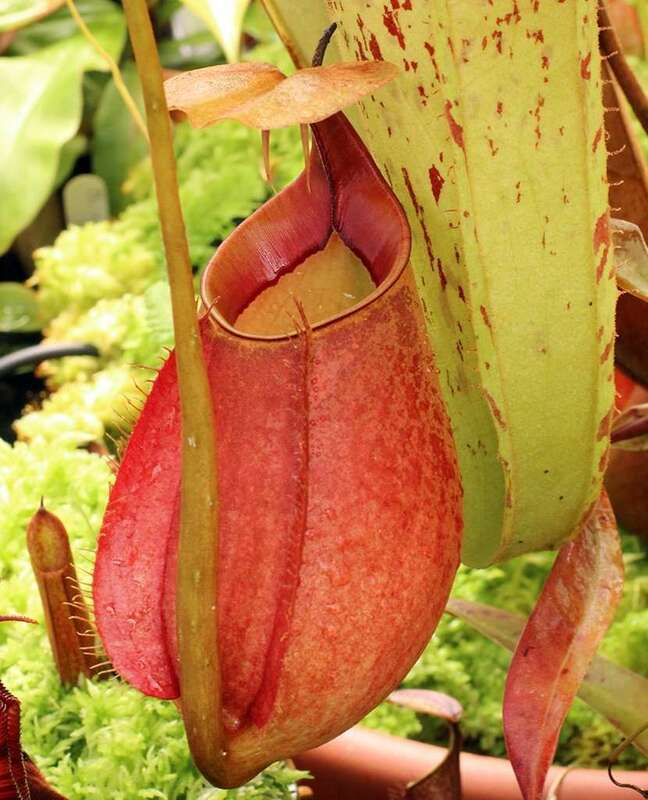 This plant is often mistaken for one of its parents, Nepenthes alata. 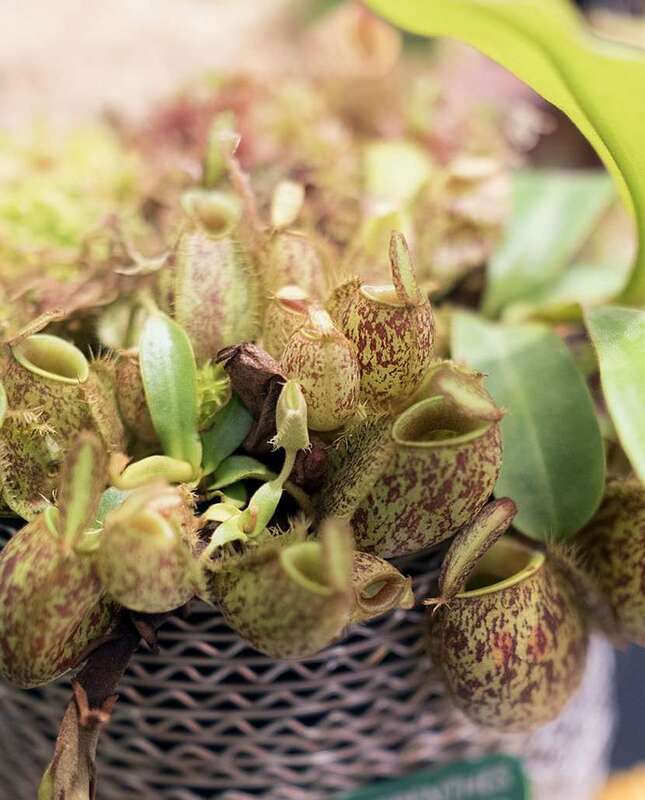 Make sure to take a sharpie with you to your local nursery and correct all the name tags. 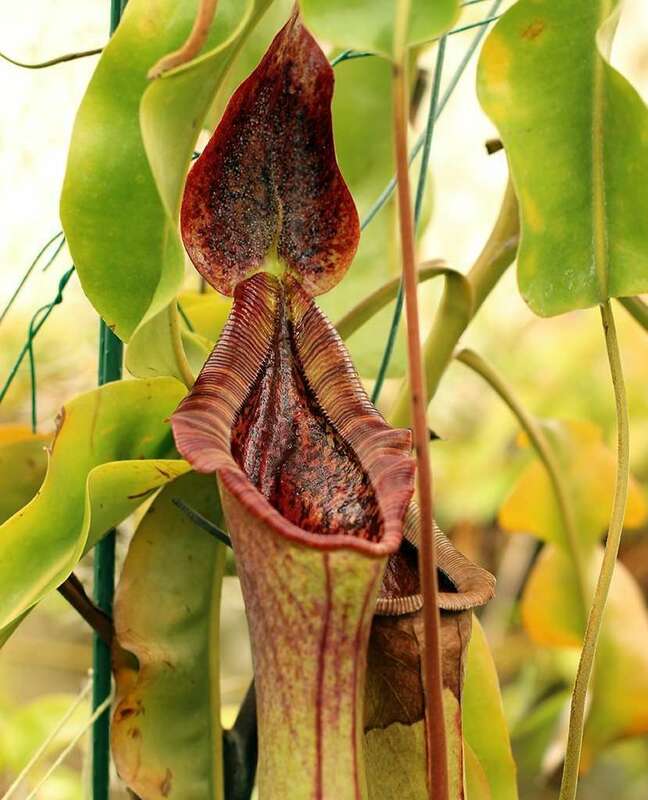 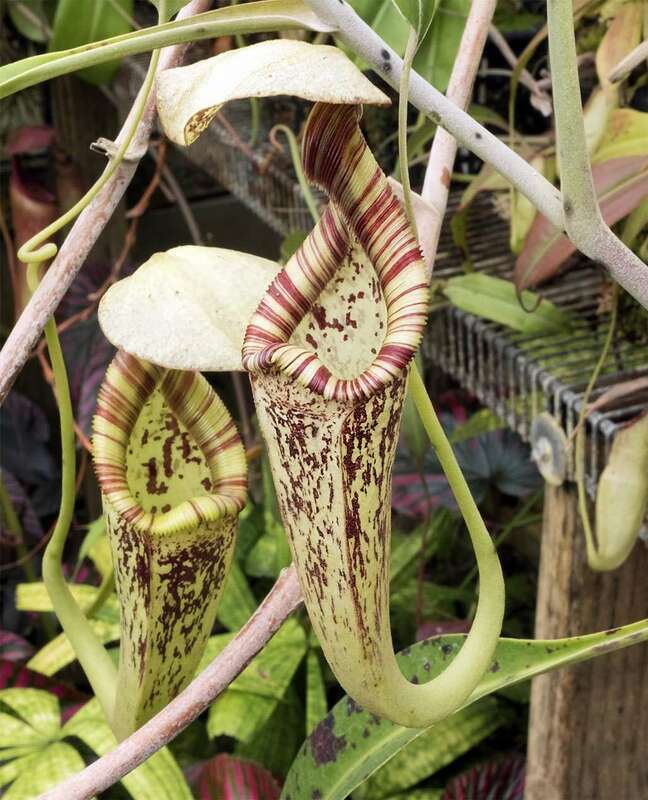 Nepenthes x ventrata has handsome 4-6 inch (10-15.25 cm) pitchers that taper from the digestive zone to the upper pitcher area terminating in peristome. 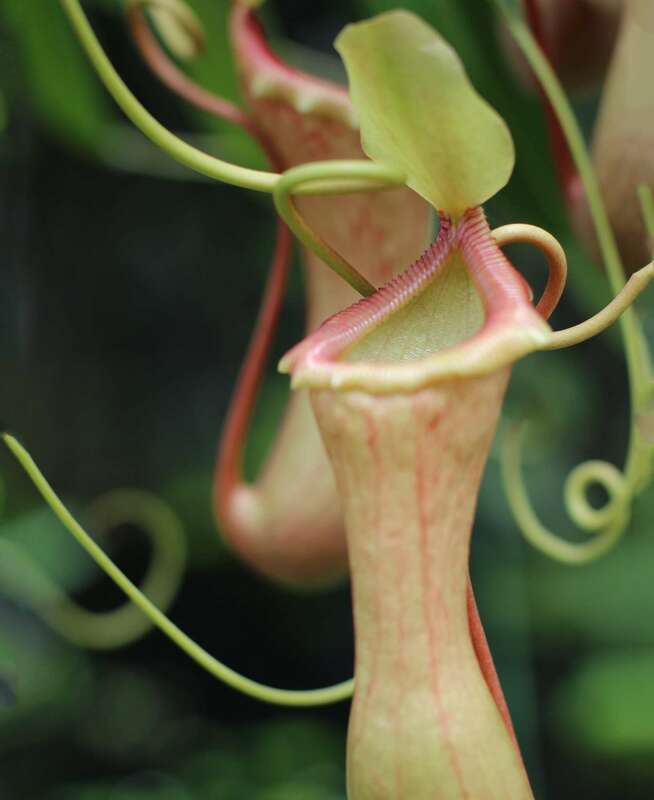 Color fades from green to pink and tendrils are often pink. 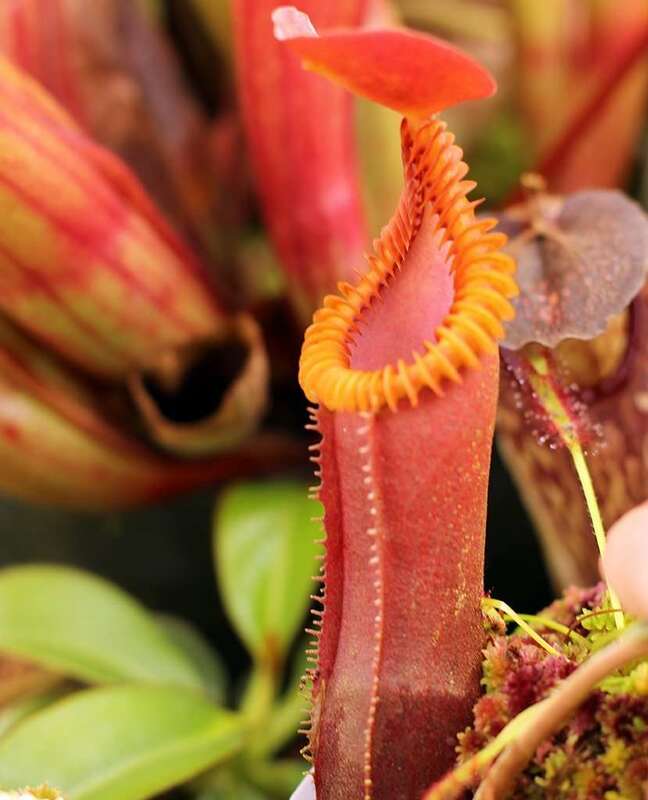 Coloration is darker pink in lower pitchers where wings are mild, but existent. 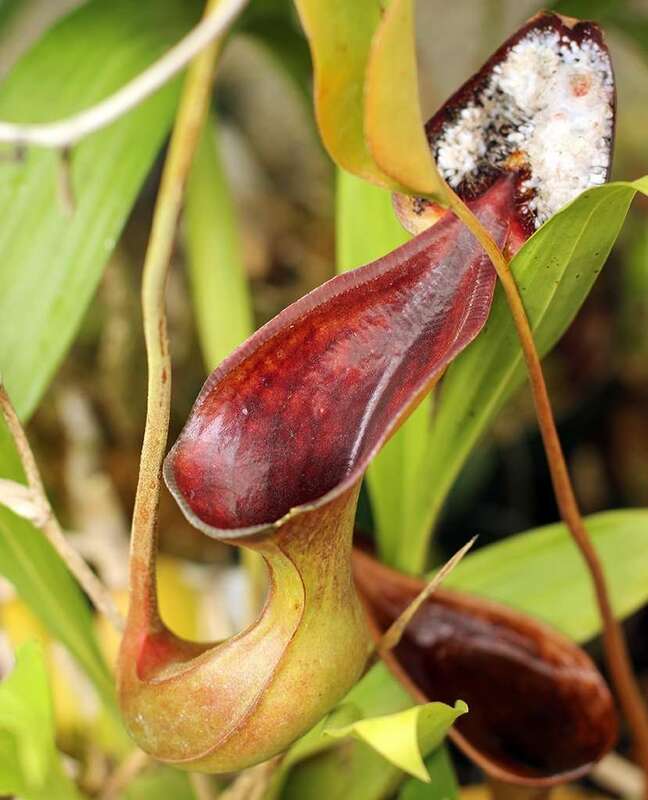 In upper pitchers, coloration lightens and wings disappear entirely. 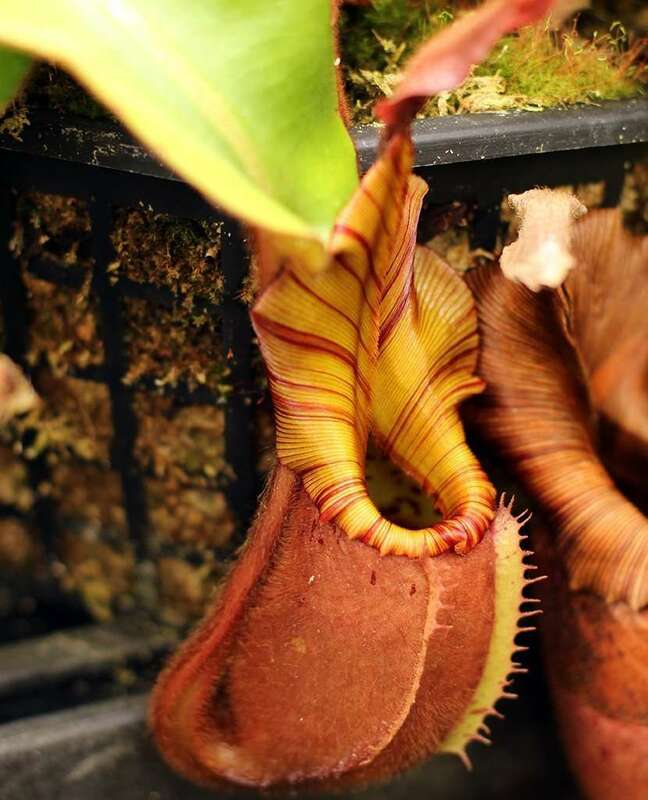 The peristome is relatively thin and tame when compared against giants like Nepenthes robcantleyi, N. truncata, and N. veitchii. 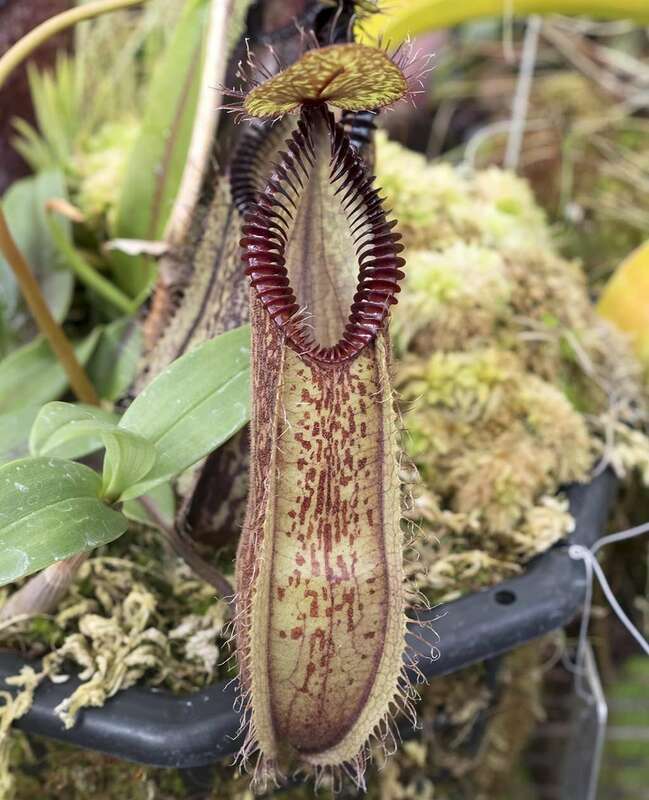 N. x ventrata seems to compensate for pitcher size with quantity – because of how fast they grow, N. x ventrata can produce and maintain a dozen healthy pitchers simultaneously. 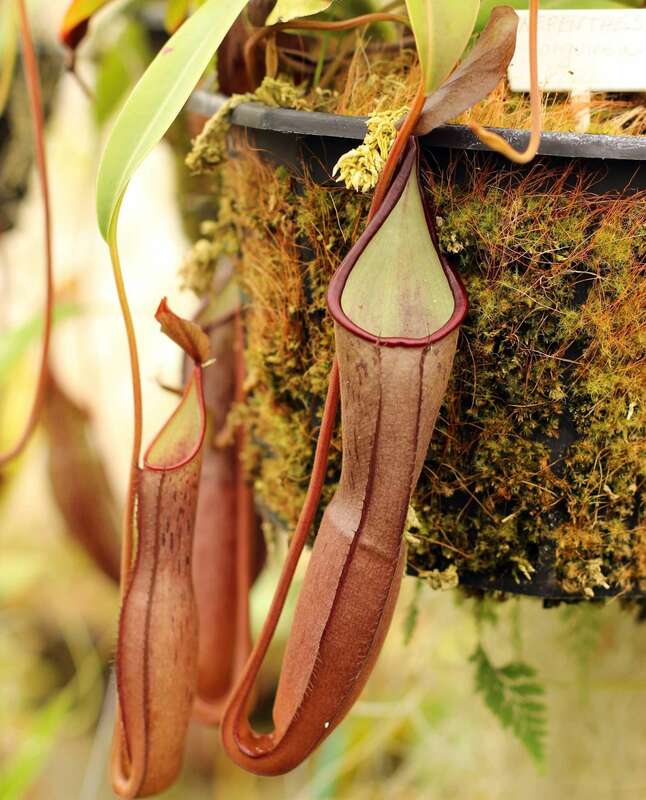 Nepenthes ventrata is easy to grow – probably one of the reasons why it is so popular. 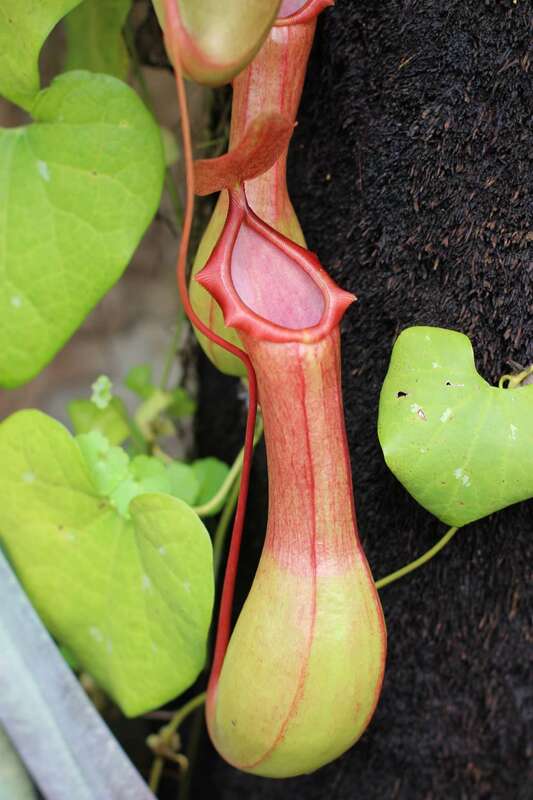 It does well in intermediate conditions, and bushes. 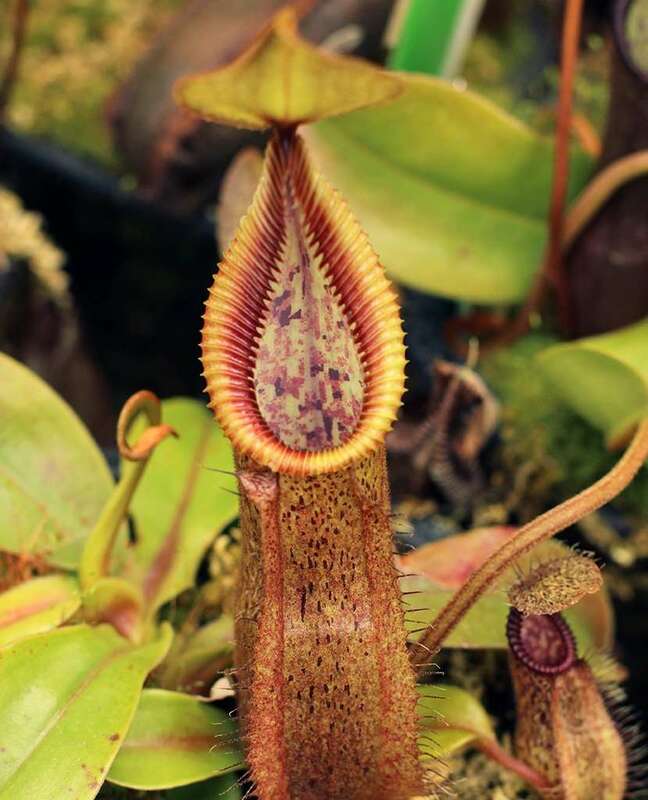 The plant produces ample basal shoots and readily forks when main growing shoots are removed. 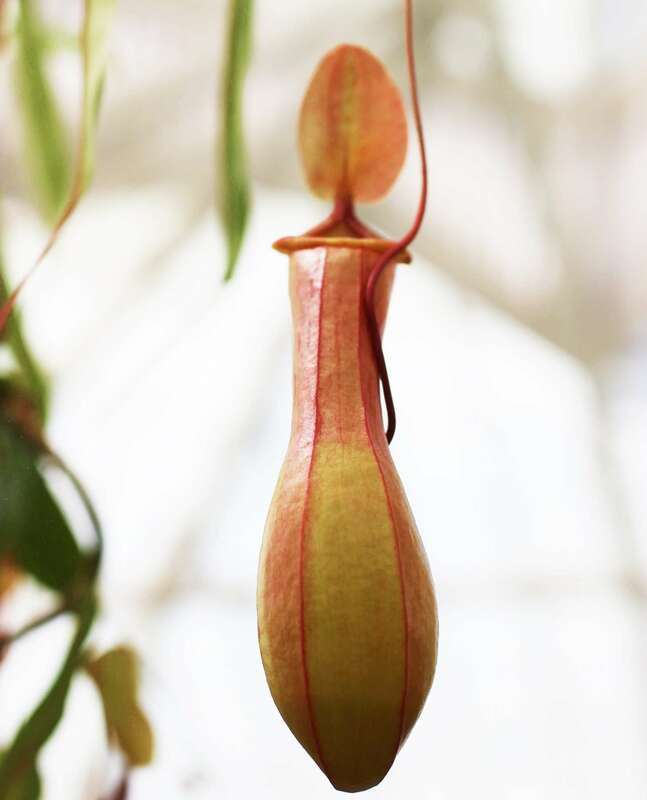 Internode distance remains relatively tight, but because the plant grows quickly, it vines and will need a tomato cage or other support to hold it upright. 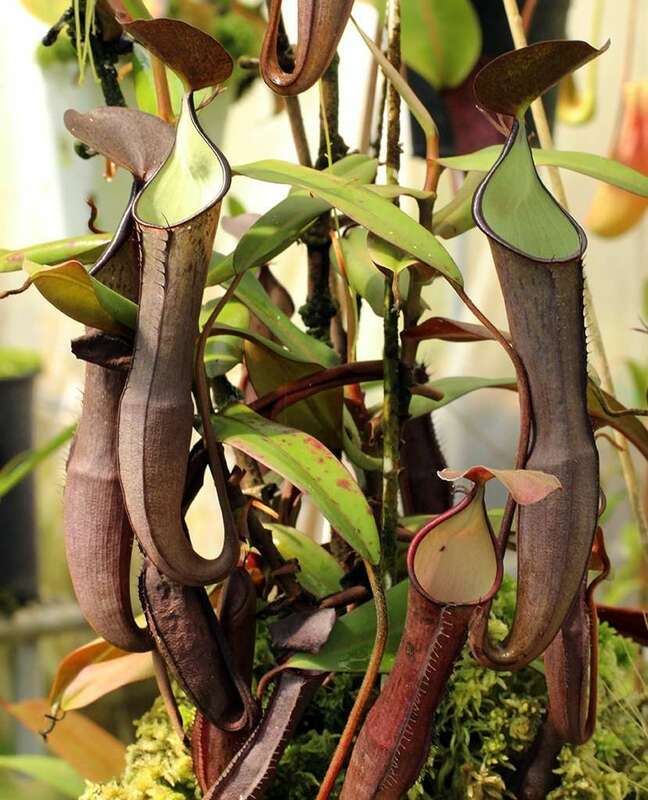 Alternatively, the plant can be left to lean, and will produce a bouquet of pitchers. 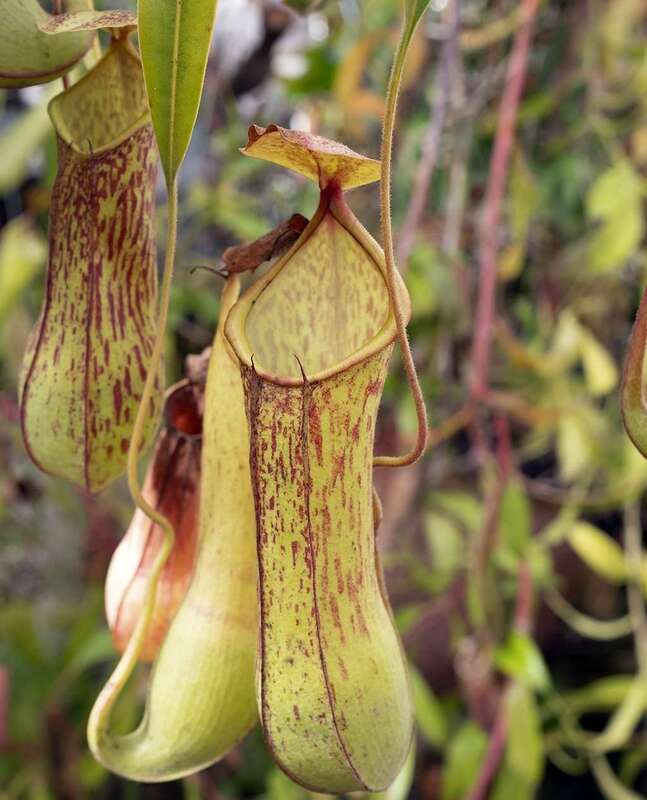 Humidity is beneficial, and will result in more numerous pitcher production. 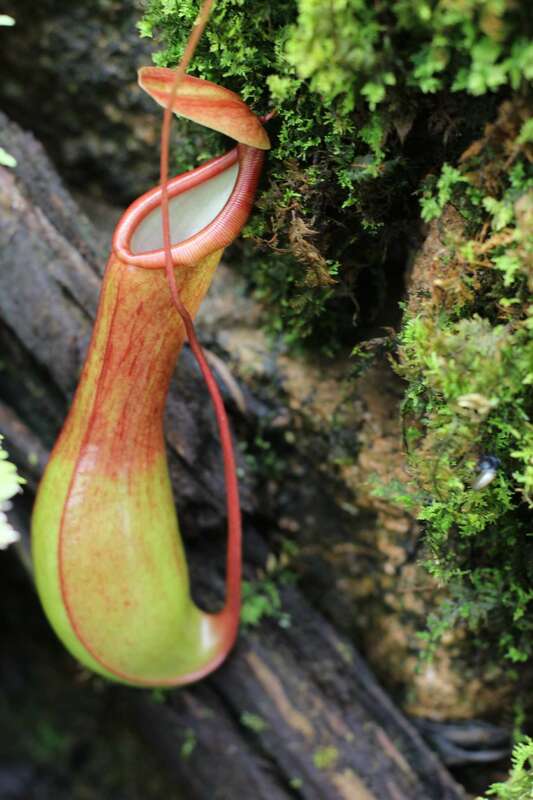 I’ve also noticed that humidity helps lengthens the life of individual pitchers.